Comprising twenty-one square miles, the Township of Randolph, incorporated in 1805, enjoyed a reputation as a popular summer resort. Benefiting from its high elevation and resulting cooler temperatures, the Mount Freedom section was a summer destination up until the early 1960s. Today, Randolph is recognized as a superb town to live and raise a family. 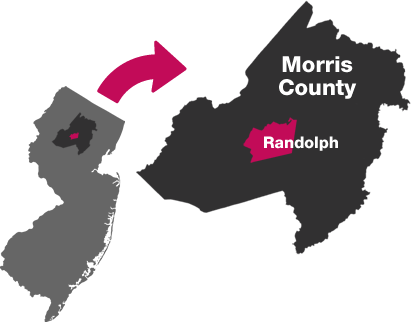 Located in the center of prestigious Morris County, Randolph benefits from excellent schools, beautiful parks and terrific recreation programs. Randolph is governed under the council-manager form of government. The elected council is the policy-making body and each year selects one of its members to serve as the town’s mayor. The township manager is hired by the council and serves as the chief executive and administrative officer of the municipal organization. Randolph is a full service organization, proud of its Triple A bond rating as determined and reaffirmed by Standard and Poors. Randolph is proud to be a modern suburban community with many residents commuting to Manhattan and corporate parks across north and central New Jersey. Our motto, “Where Life is Worth Living,” reflects the belief that Randolph offers its residents a special place in which to live and raise a family.